We have SEVEN different cruises, ranging from 1.5 to 3.5 hours, with family-friendly prices. We have a cruise for you: � a morning or afternoon Nature Cruise that suits toddlers to grandparents � an easy way to entertain visiting family and friends � a wildlife-viewing excursion where you can look at birds with your binoculars � a quiet, romantic adults` Sunset Cruise � an HGTV-type tour of a variety of Waterfront Homes Or you can rent the whole boat for a Private Pontoon Party! � Kids Adventure Cruises are action-packed and perfect for children`s birthdays � Church groups, adults and seniors, bring your own food & beverages and enjoy a unique social outing. We can seat 22 passengers and still have room to roam around the boat. Free bottled water and nice restroom aboard. RESERVATIONS ARE A MUST, walkups welcome if space permits. Almost 4 miles of paved walking trails. 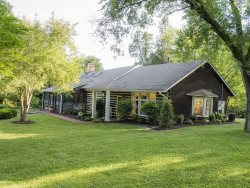 Catch an insider`s glimpse of life as a country music star at Fontanel Mansion. This 27,000 square foot log cabin, formerly owned by hall of famer Barbara Mandrell, offers guided tours and stunning architecture.